Since 2007, clinical trials using gene therapy have resulted in often-dramatic sight restoration for dozens of children and adults who were otherwise doomed to blindness. Now, researchers from the Perelman School of Medicine at the University of Pennsylvania (Penn) and The Children’s Hospital of Philadelphia (CHOP), together with colleagues, have found evidence that this sight restoration leads to strengthening of visual pathways in the brain, published in the July 15, 2015 issue of Science Translational Medicine. The article is titled “Plasticity of the Human Visual System after Retinal Gene Therapy in Patients with Leber’s Congenital Amaurosis.” “The patients had received the gene therapy in just one eye (their worse seeing eye), and though we imaged their brains only about two years later, on average, we saw big differences between the side of the brain connected to the treated region of the injected eye and the side connected to the untreated eye,” said lead author Manzar Ashtari, Ph.D., Director of CNS Imaging at the Center for Advanced Retinal and Ocular Therapeutics in the Department of Ophthalmology at Penn. Ashtari is the former Director of Diffusion Tensor Image Analyses and Brain Morphometry at CHOP. “It’s an elegant demonstration that these visual processing pathways can be restored even long after the period when it was thought there would be a loss of plasticity,” said senior author Jean Bennett, M.D., Ph.D., the F.M. Kirby Professor of Ophthalmology at Penn and Director of the Center for Advanced Retinal and Ocular Therapeutics. The team examined ten patients who have Leber’s congenital amaurosis Type 2 (LCA2), a rare disease that afflicts those who inherit one bad copy of an LCA2 gene from each parent. LCA2 causes the retinas of those afflicted to degenerate slowly and the patients typically have limited visual function at birth and then experience progressive loss of their remaining vision, rendering them completely blind by mid-life. In one of the first great success stories for gene therapy (http://www.uphs.upenn.edu/news/news_releases/apr08/gene-therapy-vision.html), Dr. Bennett’s team and others demonstrated the effectiveness of LCA2 gene augmentation in animal tests stretching back to the early 2000s. The basic strategy is to inject a harmless virus that inserts good copies of the normal LCA2 gene into retinal cells. Patients who have received the gene therapy have commonly gone from being blind or near blind to being partially sighted and able to navigate almost normally. Dr. Ashtari, a neuroimaging specialist, addressed this question with several experiments. First, she compared the LCA2 group, which had initially received the gene therapy in one eye for safety reasons, to an age-matched control group with normal vision. Using an advanced method of MRI technique to uncover deep brain connections, she found that while the connectivity of the visual pathway from the treated eye in LCA2 patients was similar to that of sighted controls, the untreated eye showed weaker connectivity to the brain as compared to the connections for the treated side. The data showed that the retina-brain pathways in the treated eyes in the LCA2 group seemed nearly as robust as the corresponding pathways in the sighted control group, implying that these pathways had largely rebuilt themselves in the LCA2 patients, following their retinal intervention. “That was what we expected to see— the more the treated eye sees the world and interacts with the environment, the more it stimulates the pathway and the stronger the connecting pathway becomes between the retina and the brain,” said Dr. Ashtari. The result came despite the fact that many of the LCA2 patients were in their 20s, and one was even 45—an age when the ability of the nervous system to rewire itself is thought to be greatly reduced. Dr. Ashtari also found a strong hint in the data that the treated-eye pathways tended to be in better shape when more time had elapsed since the treatment, implying that these pathways continue to improve with use. By contrast, the untreated-eye pathways showed a clear decline with time. In further tests, Dr. Ashtari used functional magnetic resonance imaging (fMRI) to confirm the stronger connectivity of the brain’s visual fibers for the treated-eye. There was a symmetrical brain response in normal sighted individuals stimulated in a given eye, whereas, LCA2 patients showed much greater brain responses when the treated eye was stimulated. “All this mirrors the results of other testing in these gene therapy recipients, which shows that they’re functioning better too,” said Dr. Bennett. The patients in this study have since gone on to receive the gene therapy in the eyes that were initially untreated. Dr. Bennett’s team is now completing a larger Phase 3 clinical trial, results of which are expected to be reviewed by the FDA next year, potentially leading to wider clinical use of the LCA2-restoring therapy. In connection with that larger trial, Dr. Ashtari is now doing a comprehensive imaging study, among other comparisons of the brains of patients before and after treatment. “I’m confident that as that study progresses, Dr. Ashtari will be able to reveal the fine temporal-spatial details of neural plasticity in humans,” said Dr. Bennett. The other co-authors of the study were Philip A. Cook, Kenneth S. Shindler, Kathleen A. Marshall, Puya Aravand, James C. Gee and Albert M. Maguire, all from Penn; Laura L. Cyckowski and Arastoo Vossough, from CHOP; Hui Zhang of University College, London; and Chris I. Baker of the National Institutes of Health. 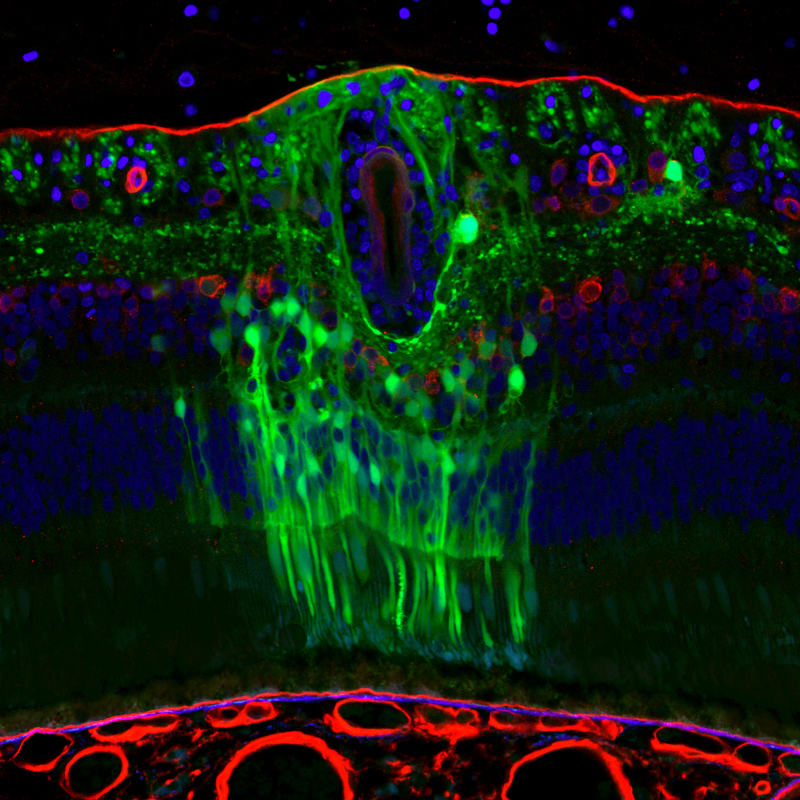 The image shows evidence of retinal gene therapy in a non-human primate.